The recent installation of a Chin Fong 250 double crank press. PRESS Shop Automation specialises in innovative installations of metal stamping equipment, specifically tailored to individual clients’ requirements ensuring all criteria are adhered to and delivering a first-class, competitive solution. The latest innovative installation involved a Chin Fong 250 double crank press fitted with a two-dimensional Servo/Servo transfer system. The components are picked up by small vacuum pads and transferred to the next tooling stage, where they are picked up by tiny gripper cylinders. The metal stamping production runs at approximately 20 parts per minute, is fully automatic, fully guarded to AS 4024-1 Category 4 and the pneumatics, electrics, electronics and emergency stop circuits all conform to Australian standards. The material is fed to the press by a Tomac Servo straightener/feeder and as a standard feature of the product the pilot release operates on all rolls. 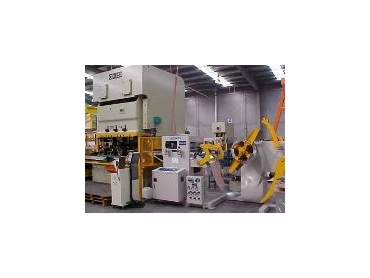 Press Shop Automation specialise in metal stamping technology. They can effectively project manage large-scale, cost effective innovative installations to the value of $2 million in Australia and New Zealand including multiple replacement of Chin Fong presses and replacement of press feeds.